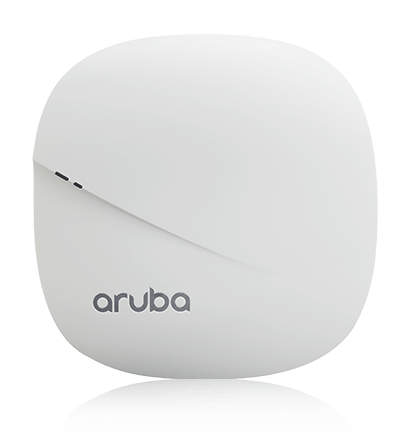 The affordable, mid-range Aruba 207 Series access point delivers high performance 802.11ac for medium density enterprise environments, such as schools, retail branches, warehouses, hotels and enterprise offices, where the environment is cost sensitive. The compact Aruba 207 Series AP delivers a maximum concurrent data rate of 867Mbps in the 5GHz band and 400 Mbps in the 2.4GHz band (for an aggregate peak data rate of 1.3Gbps). With the integrated Bluetooth Aruba Beacon, the 207 Series AP provides advanced location and indoor way finding, and proximity-based push notification services while simplifying the remote management of battery-powered Aruba Beacons. View all the part numbers and accessories you will need to order a 207 Series AP. The Aruba 207 Series APs can be configured to provide part-time or dedicated air monitoring for wireless intrusion protection, VPN tunnels to extend remote locations to corporate resources, and wireless mesh connections where Ethernet drops are not available. Aruba 207 Series APs offer a choice of operating modes to meet your unique management and deployment requirements. Aruba Instant mode – In Aruba Instant mode, a single AP automatically distributes the network configuration to other Instant APs in the WLAN. Simply power-up one Instant AP, configure it over the air, and plug in the other APs – the entire process takes about five minutes. If WLAN requirements change, a built-in migration path allows 207 Series Instant APs to become part of a WLAN that is managed by a Mobility Controller. AP-207/IAP-207: Two integrated dual-band downtilt omni-directional antennas for 2x2 MIMO with peak antenna gain of 3.9dBi in 2.4GHz and 6.8dBi in 5GHz. Built-in antennas are optimized for horizontal ceiling mounted orientation of the AP. The downtilt angle for maximum gain is roughly 30 degrees. Combining the patterns of each of the antennas of the MIMO radios, the peak gain of the effective per-antenna pattern is 2.7dBi in 2.4GHz and 4.8dBi in 5GHz.